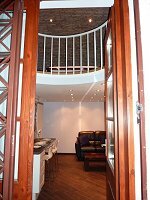 We took our time over renovating our apartments because we wanted to preserve the old Hungarian character whilst having all the advantages of modern living. We explored the fascinating antique come flea market on the outskirts of Budapest, called Ecseri, where we found our original light fittings and door handles, and visited many auction houses to buy original pictures and furniture that we then restored. 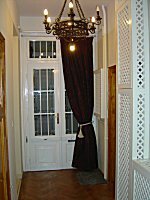 When we bought Nador 19 in 2007 the courtyard and grand, classically arched interior of the house were still in a rather dilapidated state, but now the courtyard is completely restored and redecorated and looks fantastic. In time the same will happen to the courtyard at Nador 8, meanwhile it has the shabby chique charm of former grandeur.